My class have been writing short descriptive passages about soldiers in the WW1 trenches. At the weekend I planned for them to record these over a background of sound effects. I had spent some time at freesound.org and downloaded 20 or so effects and sounds. I had converted these to MP3 files, to reduce file size and placed these in a folder in OneDrive which I then shared. I have also made a list of credits for the files, all are Creative Commons. The plan was to get the class to listen to the files in OneDrive then ‘open’ the ones they wanted to use in bossjock jr. These could then be loaded into ‘carts’ alongside the voice recordings. The pupils then played the different sounds and record that for their final mix. To make sure everything went smoothly I got the whole class to open OneDrive and make sure they were logged in. That first step worked fine. The problem was OneDrive reported that there was not an internet connection and showed no files or folders. Since the class had logged into Glow this was obviously wrong. I ended using most of the morning interval and lunchtime trying to see where the problem was. Strangely when I opened the iOS Files app when also allows you to see OneDrive files, I started slowly seeing files on the pupils iPads. And when I switched back to OneDrive the appeared there. 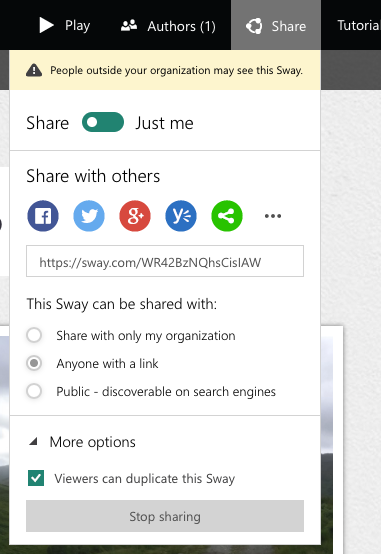 To give the pupils access to the shared folder I needed to send a url. 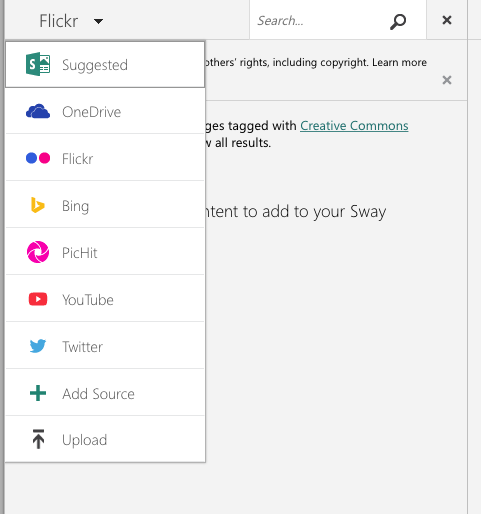 This opens OneDrive, and that told me I needed to open the browser, doing this, and signing on to Glow again (in the browser this time) eventually gave pupils iPads a view of the shared folder. Unfortunately I couldn’t get these to open and then open in bossjock in a timely fashion. It just was taking too long. On my iPad I had earlier made the files available off line in OneDrive. This took a while. 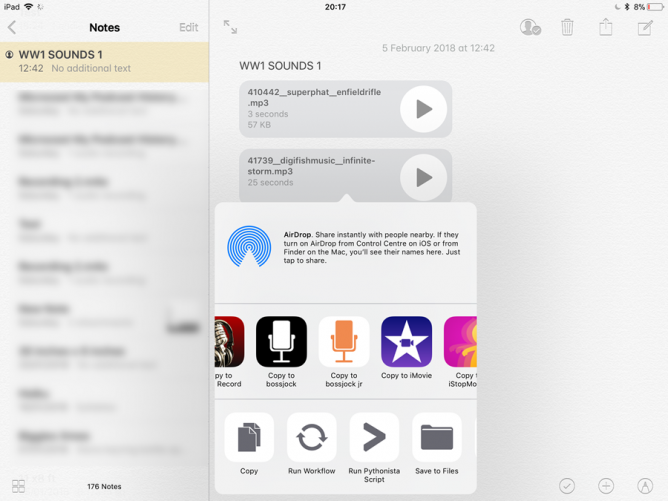 I did manage to see the files in the Files app, from there I copied the MP3 files to the Notes app. 2 notes with about 10 files each. I quickly tested sharing these notes via Airdrop, it was pretty quick. I suspected that airdropping notes with 10 audio attachments might be a bit slow, especially without Apple Classroom. I was wrong. In the afternoon I just dropped the notes to the pupils in groups of 4 or 5 at a time and in 10 minutes had distributed 20 audio files to all of the class. From there they could listen to the files in notes and copy the ones they liked to bossjock. The rest of the afternoon when well, the children recorded their voices and mixed in the sound effects. For a first try the results were good. Next time I think we will record the audio live over the backgrounds that would allow us to duck the effects and make sure all of the words were clear. I think once the logistics of moving audio onto the iPads was sorted it becomes an interesting and valuable lesson. Fortunately the class missed all of the boring bits and no one asked why we had opened OneDrive earlier in the day. My home WiFi is faster than school. Moving files locally is quicker than the cloud. We can have a lot of fun with bossjock. Notes and Airdrop are marvellous. featured image, screenshot of sending audio from Notes to bossjock jr.
I’ve not really checked out the new features of WordPress 4.4 in any depth but this new feature looks interesting. Just pasting a url to another WordPress blog post into the editor creates an embedded ‘card’ with some details. I could imagine this would make a nice way of linking to pupil or class blog posts in a school blog. Hopefully we will not wait too long before Glow Blogs get to WordPress version 4.4. I’d have like it even more if the embed above had picked up the featured image for the post. Update, I think there is something unexpected going on with this post, either from the styles here or on the embedded post. looking at the source, there does seem to be an image in there! More investigation tomorrow. Update 2: the thumbnail shows up for me now! 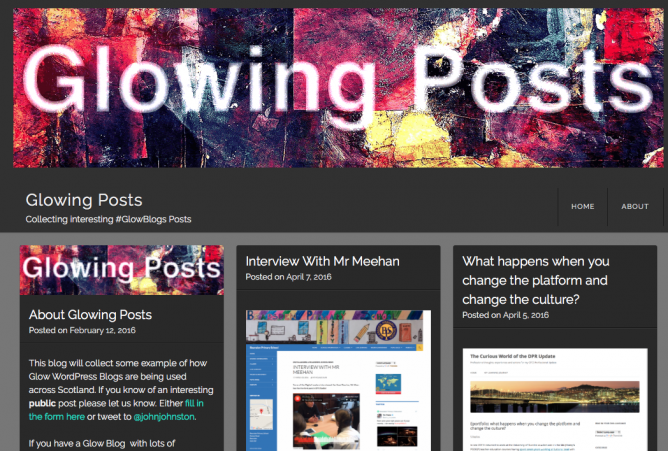 The biggest reason for creation of a blogs in the Glow Blogs system has be e-Portfolios. There are 10s of thousands in the system. Until now the system used was based on one of 60 different e-Portfolio themes created by Alex Duff during his time at Education Scotland. The old system had a couple of problems, firstly the creation of blogs was time consuming due to the way the old Glow Blogs were hooked into SharePoint, secondly the themes all needed maintenance and updating. This maintenance would be expensive as the 60 themes were all different. The amount of development and testing would have needed more resource and time than we have available. The first problem was solved when the blogs were decoupled from Sharepoint in October last year. The e-Portfolio plugin solves the second. Early on in our planning of the new WordPress blogs in glow and the migration of the old plots we decided that the best way to tackle this was to move away from theme based e-Portfolios to ones based on a plugin. This plugin would produce profiles from posts that were added to the blog. The profile is really the only way that the e-portfolio blogs differ from a standard blog. Initially our thoughts were to separate the e-Portfolios and other blogs onto two different instances of WordPress with different functionality. At the start of development it became apparent that this would be both technically difficult and would risk loss or damage to the data in the system. As we got nearer to the old system being shut down it was decided that the e-Portfolios would be developed in a future phase after the initial migration and upgrade to the WordPress software. During this time we did develop the requirements for a new system, and over the past year I’ve discussed these plans with a lot of our stakeholders. 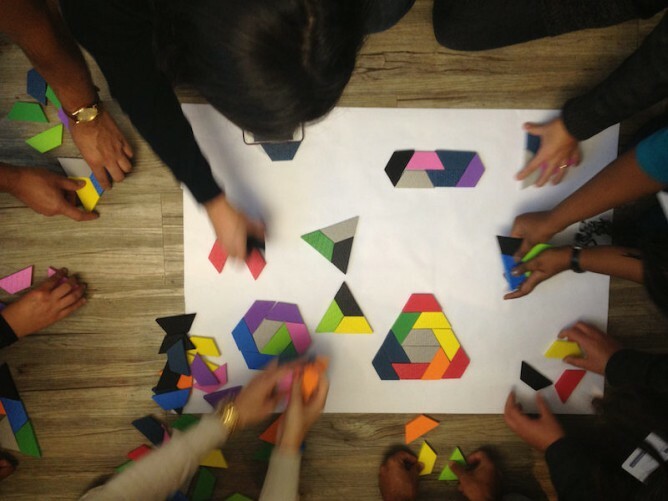 The requirements were put together and rationalised beautifully by Sonali Nakhate who was first the business analyst and then project manager for Glow Blogs. Running along side this development and feeding off the requirements was the creation of a test plan. David Orr and Grant Hutton from the Glow test team planned to test all of the new functionality and equally importantly that the new features does not break any of the old ones. As development finished the test team fed back and the odd bug were found and squashed. It is testimony to Stephen that the testing took less time than planned allowing us to get to release ahead of schedule. The development and test teams are coordinated and run by Geoff Turnbull Glow’s technical architect, Geoff also fed into all aspects of the blog requirements gathering and development from the start. Many other members of the Glow team fed into the process along with colleagues from the digital directorate and other parts of Government (procurement, security and more). All of the blog team are also involved in other parts of the Glow program too. There are still two other phases of e-Portfolio work planned, the adding of class sets to user mange to and a way for teachers to easily see activity from the pupils they are working with without having to visit individual sites to check for activity. I am look forward to watching these developments from a bit further off as my secondment finishes at the end of this month. One of the most interesting and enjoyable parts of my secondment has been the chance to work in the blog team alongside these folk who both understand their respective jobs and how they fit together. In the past when I started blogging and podcasting with my pupils I hashed and bashed my way through the technicalities, it has been delightful to see the way this can be done well at scale. We are developing some help for the e-Portfolio plugin on the glow blog help site. Featured image: Team Working Flickr by Mauro Public Domain. On of the things I am most happy about in my involvement in Glow Blogs is the syndication plugin. The UoD EduShare site is a better example of its use than I could have hoped for. 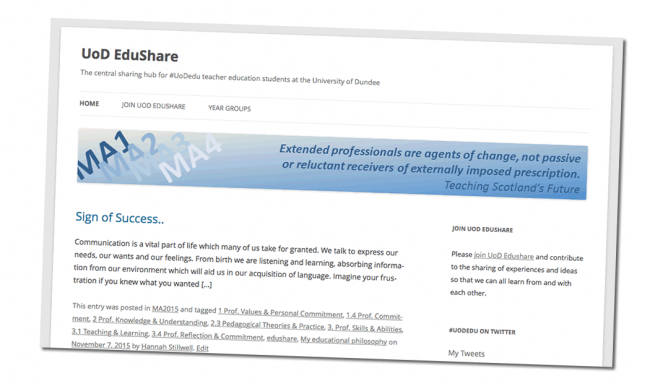 UoD EduShare aggregates posts from student teacher’s blogs at the University of Dundee. In the short time it has been running it has pull in links to and excerpts from over 400 posts from over 90 blogs. A few clicks and a bit of reading shows how involved the students are with their learning and an enthusiasm for sharing their thoughts. I am excited about this project because it is a great example of what blogs and syndication can do. Longer term we will have teachers entering the profession with a great understanding of this digital environment. Previously I’ve used the syndication plugin a couple of times now for Blogging Bootcamp #2 and #ShareOurLearning. These are smaller aggregations than the one Derek is running. In fact Derek found that the plugin had problems. Once he had added around 70 blogs he could not add any more. This bug has been fixed and the fix applied to the blog service last week. We are currently very lucky in having a great team working on Glow Blogs. Our technical architect prioritised this as a degradation of an expected service and between our developer and test team a solution was found, developed, tested and released quickly. If you are a user of Glow Blogs and want to use the syndication plugin there is a help page on using the plugin: Syndication Plugin and I’ve put together a page on Running An Aggregated Course or Collaboration in Glow Blogs. I’d be more than happy helping folk get started with using the plugin on Glow Blogs. Wondering best way to have videos in a @GlowScot WordPress Blog? 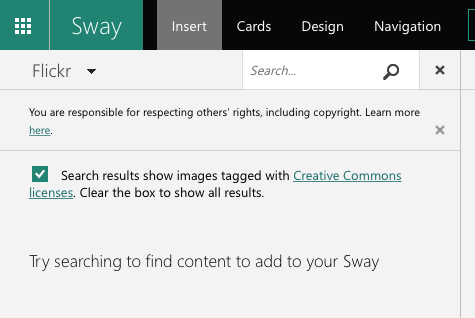 Can I upload to Sharepoint and embed? Don't really want to use YouTube. Ta! and now have time to type a few notes. Video blogging is obviously a powerful tool for learning, used in Flipped classrooms, for showing learning of all sort and an engaging activity in its own right 1. In the ‘old’ Glow Blogs using the old version of WordPress you could only upload files of <8MB you could use the Anarchy Media player to display video, uploaded or linked from elsewhere. Our more up-to-date version of WordPress supports better video embedding without plugins and we set the maximum file upload size to 50mb. Apart from file size video formats are a bit of a barrier to using video in blogs. It is better to use an external service such as YouTube or Vimeo. These services prepare the video for playback on a wider ranges of setups and also will hold much bigger video files. The disadvantage of these services is that they may be blocked on school networks. When planning the upgrade to Glow Blogs we were advised by the technical team that the blog environment was not an appropriate place for hosting video. I pushed for 50MB file upload as a stopgap in case video file hosting in Glow did not develop in a way that could be used by the blog service. Using YouTube & Vimeo video on Glow Blogs is a snip, both provides support oEmbed. This means that you just paste the url to a video page into the blog editor and the video will embed. The first time you see this happening is quite a pleasant surprise as the video is embedded in the editing field to. Flickr video works in the same way but flickr video is limited to playing 3 minutes. In the most recent release on Glow Blogs, August 2015 we added support for ClickView video too. ClickView does not support oEmbed, but or developer added the ability to take the url from a ClickView embed code and use that in the same way. 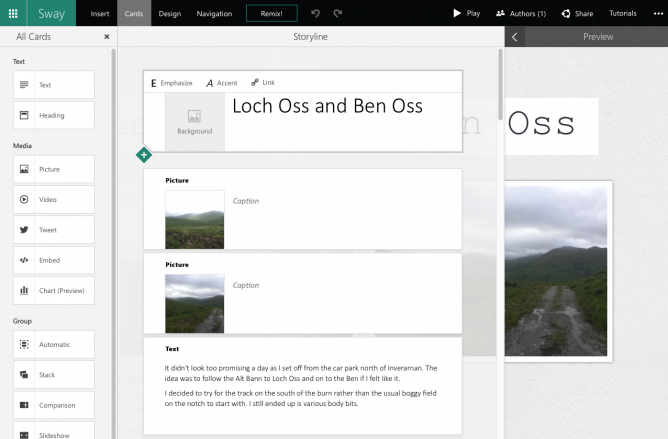 There is also the possibility of using Office O365 video from the glow tenancy. Currently O365 video is awaiting contractual clearance. Of course at the moment Office Video, like the rest of Glow O365, is behind a logon, so not practical for public display. If you do want to host the files on Glow Blogs there are a few things to consider, the viewing of video files is a complex matrix of the video files and operating systems and browser ability to view them. The best bet is probably to go for MPEG4 2. These files usually have the extension mp4 or m4v. Lots of video editors export to mp4. If you want to make your video file as small as possible you may want to add an application for compression int othe mix. currently I’ve found HandBrake a very useful tool. Handbrake only works on the desktop. If shooting on a mobile, you will want to edit the file and export at a smaller size or use a app for shrinking video rather than uploading raw footage. Many mobile phones produce excellent quality video that results in large file sizes. Personally I’ve found uploading to Glow Blogs works fine for example the Videos on Blogging Bootcamp vary in length between a couple of minutes and forty. These are screencasts which typically compress well. Caveat, there are Video problem on iOS. The issue is now understood by the developers and we hope it will be fixed in the Glow Blogs environment very soon. Glow Office O365 not yet available. May not be publicly sharable. Personally my needs are met by keeping my videos under 50MB and uploading them to Glow Blogs. This will be improved when the iOS fix is in place. I’ve spent the last couple of days talking about Glow and Glow Blogs in particular at the Scottish Learning Festival. Today I was co-presenting at a seminar on Blogs with Mrs Andrea Hunter and three of her pupils from Whinhill Primary. I asked Andrea to be involved as I enjoyed her blog last session at Gourock Primary, for example: Why Blog? Andrea has since moved on to Whinhill Primary and is blogging with her class who joining in with Blogging Bootcamp #2 like champions. The Pupils did a great job and Mrs Hunter spelled out how to organise blogging in the classroom supporting and scaffolding their learning perfectly. This allowed me to just talk about blogging in general, touch upon my favourite topic of syndication.1 and explain a little about how the e-portfolio plugin is coming on. The seminar was filmed and I hope it published somewhere as Andrea and the pupils presentation is well worth sharing wider. 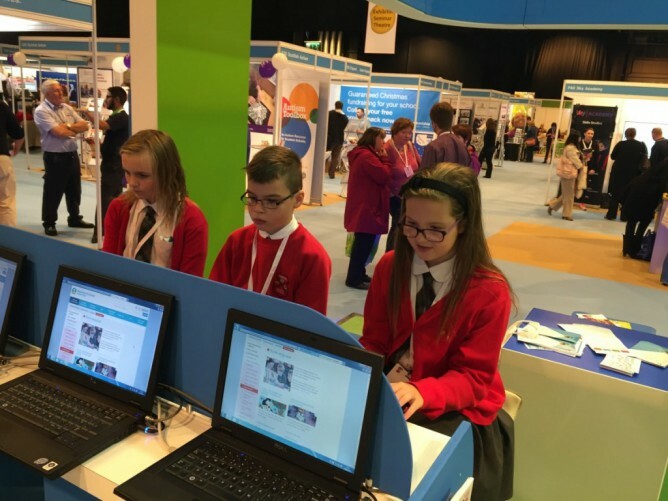 My day was made when later on twitter let me know about this post: SLF 2015 on Diary of a Whinhill Pupil. The Whinhill team had gone off around the SLF floor and must have commandeered a few computers to post to their blog. I also managed to show a demo of the new Glow Blogs e-portfolio/profiling plugin to a few folk over the two days and it was well received. We hope to have this released later this year. Featured image Mrs Andrea Hunter, used with permission. I’ll be talking about Glow Blogs in a seminar at SLF on Thursday along with Andrea Hunter PT at Whinhill Primary School and some of her pupils. Andrea’s class blog at Diary of a Whinhill Pupil. I’ll be at SLF both days spending some time on the Glow stand. If you are at SLF and have an interest in blogging, podcasting and the like please do have a chat. You can catch me on twitter @johnjohnston. I’ll also be at TeachMeet SLF15 on Wednesday evening. We will try to stream that on Radio #EDUtalk.